There have been dozens of spy films over the years, and the sub-genre is strongly associated with the Jame Bond franchise to be sure, but what do you say to a film that is not your typical gun wielding action hero? Films like The Lives of Others and Tinker Tailor Soldier Spy come to mind, but I bet you wouldn’t expect a biopic to fit the bill, now would you? Oliver Stone is an academy awarding winning writer, director and producer. Known for his tendency to focus on American political issues, Stone is something of a controversial director. He has directed Platoon, Born on the Fourth of July, Heaven & Earth, Wall Street (and its sequel), The Doors, JFK, Nixon, and W. Snowden is his latest film and maintains the pace for addressing difficult subject material. Snowden is based on a a series of books called The Snowden Files by Luke Harding and Time of the Octopus by Anatoly Kucherena. It has received mixed reviews and is a box office disappointment, only grossing $34 million worldwide on a budget of $40 million. Based on the story of Edward Snowden, former computer professional for the CIA and former contractor for the United States government. Snowden is a whistleblower that leaked classified information from the NSA in 2013 without any authorization. He has revealed that the US and European governments had been working with telecommunications companies to run global surveillance and without any knowledge from the general public. The movie opens with Snowden (Joseph Gordon-Levitt) meeting in Hong Kong with documentarian Laura Poitras (Melissa Leo) and journalist Glenn Greenwald (Zachary Quinto). They discuss releasing the classified NSA information which Snowden has stored in a Rubik’s Cube. As the movie progresses we see a series of flashbacks of Snowden’s time in the US army, his administrative discharge over a fractured tibia, application for a position with the Central Intelligence Agency, and what he learns working with his employers. Corbin O’Brian (Rhys Ifans) decides to take him on, and Snowden is educated in the ways of cyber warfare. He learns about the Foreign Intelligence Surveillance Act, which circumvents the Fourth Amendment rights of U.S. citizens by allowing warrant requests to be approved by a panel of judges that were appointed by the chief justice. During this time Snowden also meets Lindsay Mills over a dating website (Shailene Woodley), they hit it off, though they have different belief systems. Snowden’s first post is in Geneva Snowden where he begins to question the ethics of what they do. After his superior tries to force a DUI on a target of theirs, Snowden resigns the CIA. Taking a position with the NSA in Japan, Snowden builds backup program of Middle East data called Epic Shelter. He slowly learns that other countries are employing similar practices, and working together on a global surveillance program. The stress of this knowledge and the job leads to a breakup with Mills. A few months later, leaves this job and returns to Maryland to reconcile with Mills and he take a position consulting for the CIA. During a hunting trip, O’Brian asks for Snowden’s help counterattacking Chinese hackers. Snowden becomes epileptic, and Mills moves with him to Hawaii for his health, while Snowden works on this new post. Snowden learns that Epic Shelter has been repurposed to assist U.S. drones in launching lethal strikes against terror suspects in Afghanistan. Snowden reaches his breaking point and smuggles a microSD card out of The Tunnel via the previously mentioned Rubik’s Cube. He asks Mills to fly home and contacts Poitras and Greenwald for a meet. With the help of Ewen MacAskill (Tom Wilkinson), the information is disseminated to the press, and leaked over other channels as well. The three journalists help Snowden to be smuggled out of Hong Kong. However, the U.S. Government revokes his passport, forcing him to remain in Moscow. The Russian government grants him asylum and Mills joins him. Snowden continues his to fight right now. Pros: Gordon-Levitt communicates Snowden’s crisis of ethics well, and the supporting cast all aid in the progress of the story. 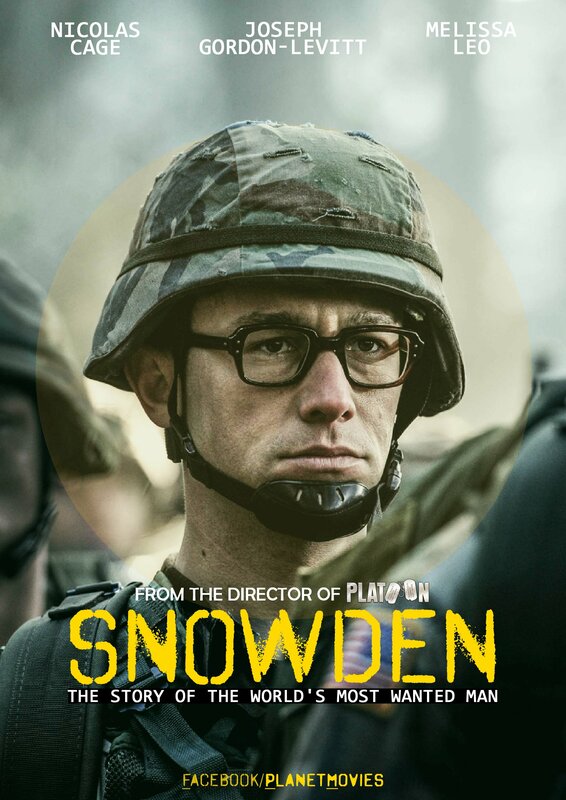 It’s clear that Oliver Stone is in reverence of Edward Snowden. Cons: The template of the action-thriller takes away from the message, and the way the story unfolds is far to safe for the subject matter at hand. Points of Interest: To ensure the screenplay was not hacked or leaked, Oliver Stone wrote it on single computer without internet connectivity. Oliver Stone also visited the real Edward Snowden after filming to show him a cut of the film. Did you know that Luke Harding is a Guardian journalist and that former editor Alan Rusbridger makes a cameo in the film? When I first watched this movie in theatres I was worried that The Guardian might come out with a biased review of the film, but I was pleasantly surprised. The highlights of the film definitely came in performances by Gordon-Levitt, Woodley, and Ifans, but this is a story that asks a question we cannot ignore, and it hits the mark. This biopic is an excellent exploration into the sub-genre and a strong urging to deal with issues of security, secrecy and privacy as they continue to evolve in our globalized world. Snowden might not be for everyone, and it is likely biased towards the viewpoint of its protagonist, but the topic is essential. And that’s all the theories I’ve got for now.